Calcareous algae tend to be affected negatively through deterioration of their calcium carbonate structures. 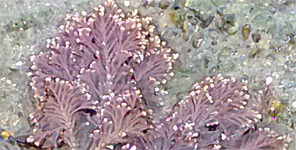 Fleshy algae and marine plants such as eelgrass tend to respond positively through increased productivity. The vulnerability of calcareous algae and the increased productivity among fleshy algae and marine plants in response to elevated pCO2 have been found in several analyses from other ecosystems (Kroeker et al., 2010, 2013; Johnson et al., 2014). Each of the region’s six coralline species studied responded negatively to pCO2 elevation in that their calcareous tissues lost structural integrity. However, there was a mixed response across species for various parameters of photosynthetic performance. Only certain aspects of photosynthesis—such as maximum relative electron transport rate and light saturation points—were enhanced by CO2 enrichment in a two-week study of Corallina officinalis (Yildiz et al., 2013). The remaining species, exposed for longer periods to high pCO2 conditions, experienced no change or reduction in photosynthetic capacity. 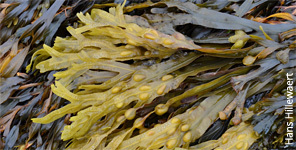 For fleshy algae and marine plant species of the Northeast, laboratory studies found that 10 of the 14 species examined grew faster (or added more biomass), while the remaining species were unaffected or lost overall biomass. Interestingly, the two kelp species that lost biomass during these experiments (Saccharina latissima and Fucus vesiculosus) are economically important species in the Northeast and globally. Faster growth rates may be attributed to the greater availability of inorganic carbon (Koch et al. 2013), which is used in photosynthesis.